The high incidence of gastric cancer justifies screening gastroscopy in Japan, whereas in most Western countries the incidence is five- to ten-fold lower allowing opportunistic gastroscopic screening and surveillance for high-risk individuals only. The major risk factors of gastric cancer are H. pylori infection and atrophic gastritis. 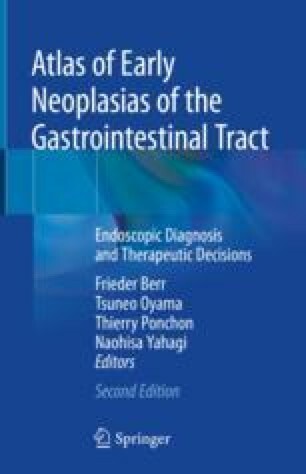 Therefore, endoscopic diagnosis for H. pylori infection and atrophic gastritis also is important for the early detection of gastric cancers. We aim to improve endoscopic detection of minute premalignant/malignant flat lesions (type 0-IIa/b/c) as well as and endoscopic prediction of the T category. This serves to distinguish lesions suitable for endoscopic snare mucosectomy, en bloc submucosal dissection, or resective surgery. The contribution of cases by Dr. Hans P. Allgaier/Freiburg, Germany and some images and histology by Dr. Tobias Kiesslich and Dr. Daniel Neureiter/Salzburg, Austria, is gratefully acknowledged.